Received October 24th, 2011; revised November 23rd, 2011; accepted December 5th, 2011.
tion of the mo del’s selection criteria based on high academic ach ievement. 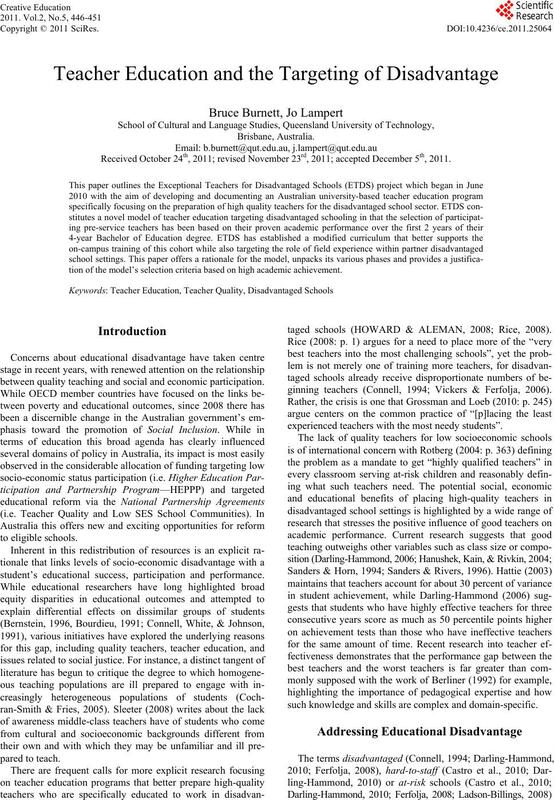 between quality teaching and social and economic participation. student’s educational success, participation and performance. taged schools (HOWARD & ALEMAN, 2008; Rice, 2008). 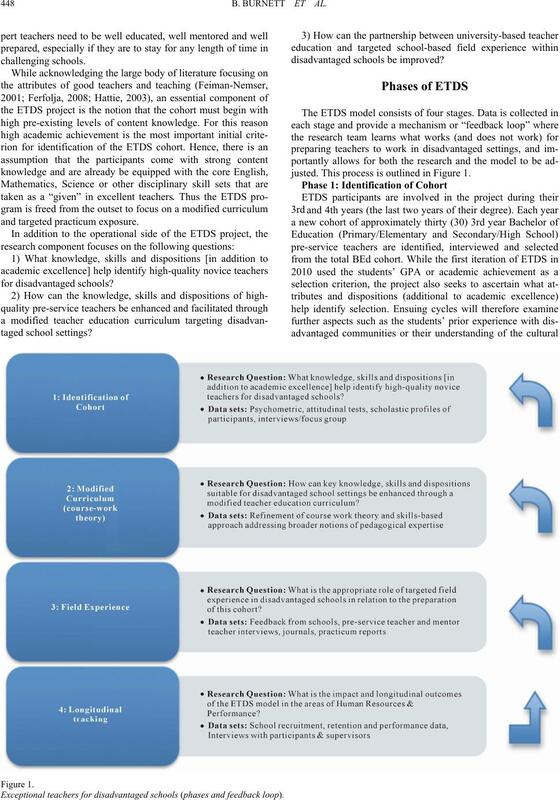 ginning teachers (Connell, 1994; Vickers & Ferfolja, 2006). experienced teachers with the most needy students”. such knowledge and skills are complex and domain-specific. comes of the communities which these schools service. experienced by students from low socio-economic backgrounds. ments of secondary school teaching registration in Victoria. popular US documentary film Waiting for Superman (2010). glorified portrayal of the heroic inner-city teacher as saviour. where they could make a real difference. anyone who “thinks they can save the world”. justed. This process is outlined in Figure 1.  Engagement with a modified cur ri culum. vantage and pragmatic forms of social justice. sector (Connell, 1994; Darling-Hammond, 2005; Flessa, 2007). partnership between teacher training and school-based practice. their school Principal as experienced, exceptional or “expert”). best teachers for the schools that need them most. 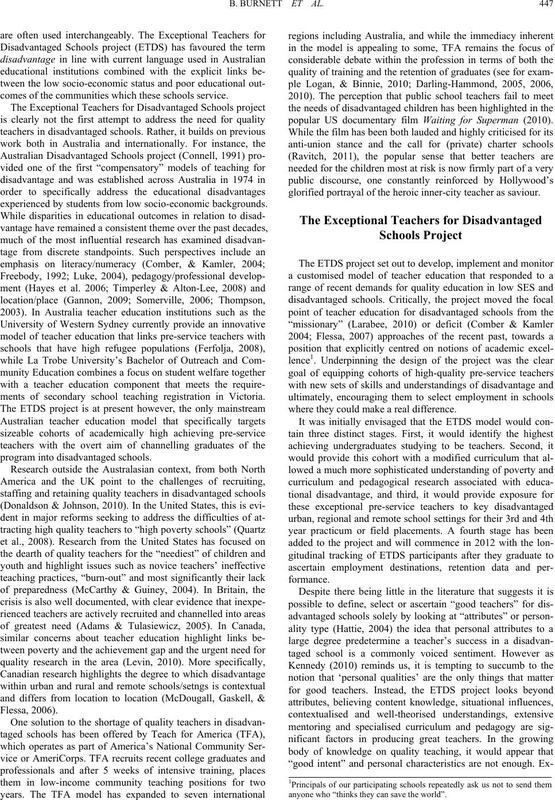 be taken into account in the selection of each ETDS cohort. Queensland who are watching the project with keen interest. age member as “finally doing something worthwhile with my life”. A European concern? Londo n: Fa lmer Press. Berliner, D. C. (1992). Telling the stories of educational psychology. Educational Psycholo g i s t , 27, 143-161.
research, critique. London: Taylor and Francis. ington, DC: American Educational Research Association. the education of at-risk students. Improving Schools, 8, 121-131.
twice as hard: The disadvantaged schools program in Australia. Burwood: Deakin Univers i t y Press. from exemplary programs. San Franciso: Jossey-Bass. future. 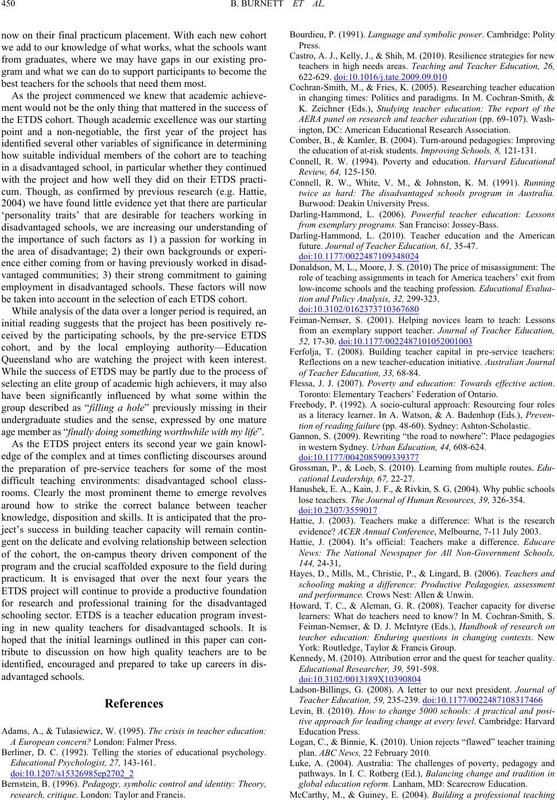 Journal of Teacher Education, 61, 35-47.
tion and Policy Analysis, 32, 299-323.
of Teacher Education, 33, 68-84. Flessa, J. J. (2007). Poverty and education: Towards effective action. Toronto: Elementary Teachers’ Federation of Ontario. tion of reading failure (pp. 48-60). Sy dn ey: Ashton-Scholastic. in western Sydney. Urban Education, 44, 608-624.
lose teachers. The Journal of Human Resources, 39, 326-354.
evidence? ACER A n nu a l C onference, Melbour ne, 7-11 July 2003.
and performance. Crows Nest: Allen & Unwin. learners: What do teachers need to know? In M. Cochran-Smith, S.
York: Routledge, Taylor & Francis Group. Kennedy, M. (2010). Attribution error and the quest for teacher quality. 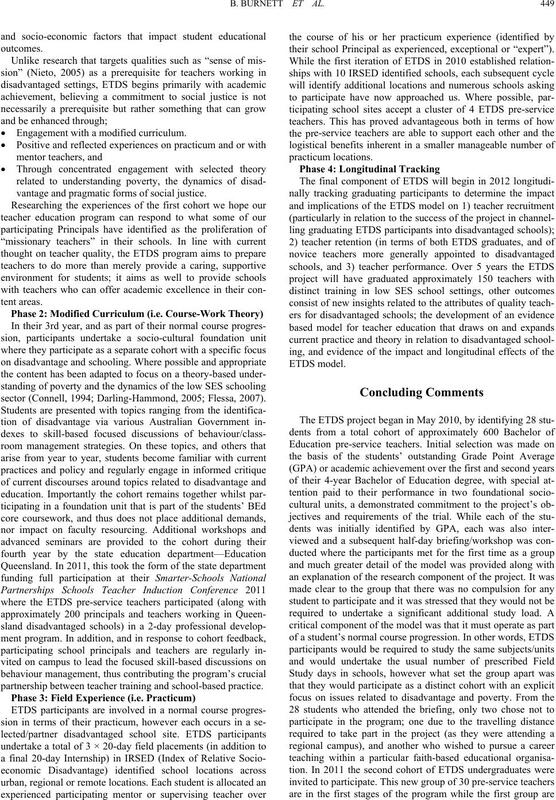 Educational Research e r , 39, 591-598.
plan. ABC News, 22 February 2010.
global education re f or m. Lanham, MD: Scarecr ow Education. schools. Boston: Boston Plan for Excellence. McDougall, D., Gaskell, J., Flessa, J. J., Kugler, J., & Jang, E. E. (2006). cumstances. Toro nt o: Un iv ersity of Toronto. Nieto, S. (2005). Why we teach. New York: Teachers College Press. urban educators. Tea c he r s C ol l eg e Record, 110, 218-250.
tion reform. Lanham, MD: Scarecrow Education. of Tennessee Value Added Research and Assessment Centre. Sleeter, C. (2008). Preparing white teachers for diverse students. In M.
changing contexts. N e w York: Routledge, Taylor & Francis Group. Somerville, M. (2006). An enabling place pedagogy for new teachers. Vickers, M., & Ferfolja, T. (2006). The classmates education initiative.